Taken using a 4th gen iPod Touch… with a little tweaking in iPhoto. It's annoying how Apple has allowed the iPod to shoot HD video but the photos aren't up to scratch in terms of quality, as you can easily tell when you view the pic at full size. Where Do Dusty Old Apples Go to Die? 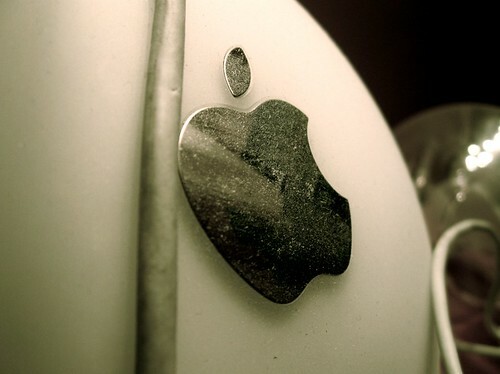 Macro shot of my iMac G4. Today was Day 1 of my shiny, new Masters course, marking my first step towards a career shift into Bioinformatics, inshā’Allāh. For those currently scratching their heads in confusion: read my earlier confession. I want to be all clever, and write some amazing account of the myriad of emotions that I've experienced over the past two months, culminating in the pinnacle of nerves that was my afternoon commute into the familiar territory of what was once my undergraduate campus. But frankly, I cannae be bothered. I can barely put a sentence together right now; I don't think mornings agree with me. Most of my day was quite “meh”, tbh. I only had two lectures, one of which was a safety induction. Yawnsville! Though, the absolute highlight of my day was when I asked the computing lecturer if having a Mac would be problematic for the programming aspect of the course. I have spent the last fortnight worrying that I'd have to buy a regular laptop, or figure out how to install Windows/ Linux on my MacBook. The head professor – the one I refer to as the 'bad cop', from my initial interview – gives me a half smile and says: “You have great taste!”. Then a few moments later, speaking over the computing guy, “We all use Macs in the lab”. And then, the cherry on the double chocolate sundae: “You know what? You've already passed!“. I reckon that I've had my iPod Touch for a couple of years now, and in that time I have discovered some great applications – and some terrible ones! But let's stick with the goodies for now, shall we? Some photos that I took during my travels to Central London today. I was also carrying a laptop bag containing the MacBook that set me back £900 earlier this year, and my purse – but that only contained £15. iDoodles: Could I Be More Girly? Finger-powered graphics drawn with the iDoodle Lite app on the iPod Touch. It's a new MacBook, alhamdulillah! Well, new-ish… I bought it second hand, but it's less than a year old, māshā’Allāh. From right to left (also from oldest to newest): My faithful iMac G4 (aka the “iLamp”); my 'foster' iBook (soon to be wiped and returned to its true family: my old research lab); my iPod Touch (the 'baby' of the family); and finally: my funky MacBook (the black sheep of the family – badoom tish. Hang on, the Touch is also black. Oh pants!). iPhone Apps: now on my iPod! Today I downloaded the iPhone 2.0 Software Update on my iPod Touch. I am now using the new WordPress app to write this entry. I have tried to blog from my iPod before, but there were too many problems, such as the inability to select categories, to consider it as a feasible method for regular blogging. But this new app fixes all that, and could prove useful for jotting down thoughts on the go – as long as I am in a free wifi zone. Another nice, free app is iQuran produced by Guided Ways. I like the fact that I can easily browse the Qur'an, surah by surah, verse by verse, selecting whichever one I want recited. It should prove useful for times that I need to check my recitation, inshā’Allāh. There is a Pro version that has more reciters and more translations available than the free app. I am considering investing in a copy… though I'm not sure if it has been released yet. So, what's your favourite App?